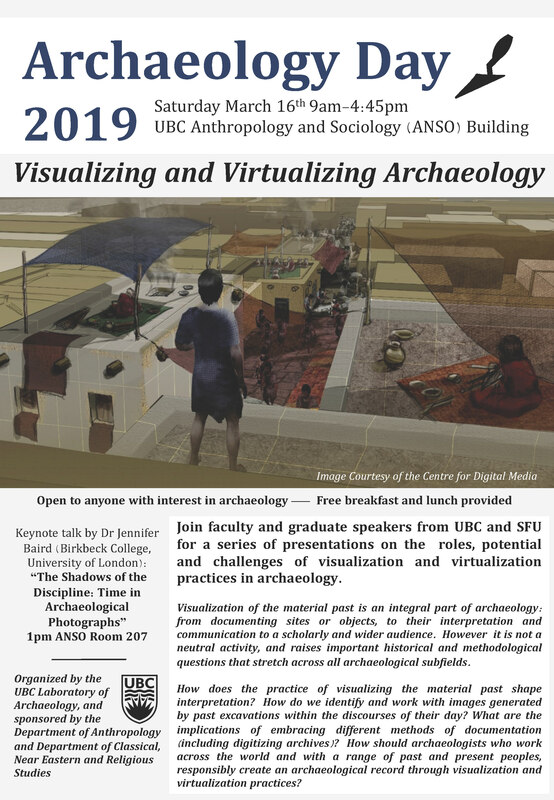 Join faculty and graduate speakers from UBC and SFU for a series of presentations on the roles, potential and challenges of visualization and virtualization practices in archaeology. Visualization of the material past is an integral part of archaeology: from documenting sites or objects, to their interpretation and communication to a scholarly and wider audience. However it is not a neutral activity, and raises important historical and methodological questions that stretch across all archaeological subfields. How does the practice of visualizing the material past shape interpretation? How do we identify and work with images generated by past excavations within the discourses of their day? What are the implications of embracing different methods of documentation ( including digitizing archives) ? 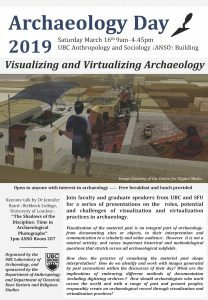 How should archaeologists who work across the world and with a range of past and present peoples, responsibly create an archaeological record through visualization and virtualization practices?